The expression ‘home cooking’ takes on a literal opening in the case of Pujol. Or at least, in this, its second incarnation. 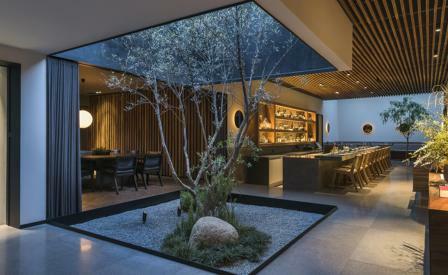 After nearly 20 years in its Calle Francisco Petrarca address, the restaurant – a Mexico City landmark that put elevated Mexican street food on the map and on the speed dial of an international cabal of foodies – recently relocated 11 blocks away to the Polanco neighbourhood, into a 1950s bungalow. Cleaving to chef Enrique Olvera’s diktat that the new premises needed to be considerably more relaxed (adios starched linen and stiff furniture), the architects JSA and interior architect Micaela de Bernardi dismantled walls and connected the two volumes of the house, including a sunken bar, via a light drenched air-well. The latter doubles as a bijou garden at the same time as it pulls the exterior into the handsome, sparely designed interiors lined with grey granite and parquet floors, low-slung mid-century furniture and timber-slatted ceiling. In the kitchen, Olvera continues to essay finely tuned interpretations of Mexican cuisine like raw fish draped with a corn sauce, the six-course tasting menu fuelled with ingredients shipped in three times a week from Oaxaca, a herb garden at the back of the restaurant, and vegetables sourced from a nearby farm.